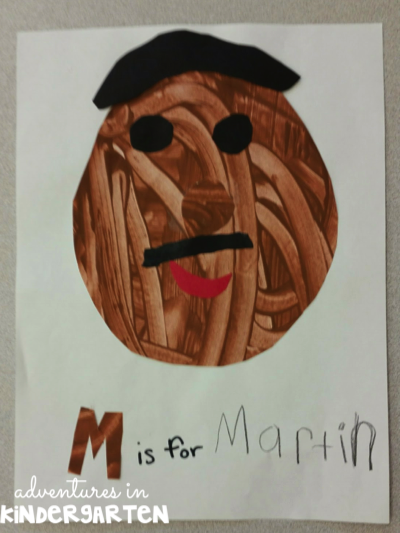 I don't know about you, but I just love teaching my little ones about Dr. King. He is so inspiring! I also find it quite a challenging subject to teach about. Almost every year, none of my students have heard of Dr. King, nonetheless segregation or civil rights. It is so difficult for their sweet little minds to understand how anyone could hate another person just because of how they look. One way that I make this complex topic a bit more kindergarten friendly is through art. 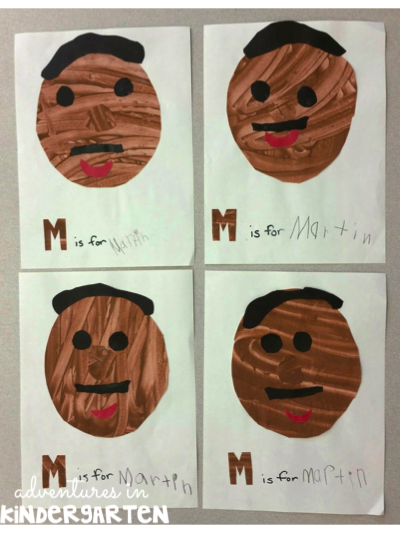 My wonderful para came up with the idea for these adorable portraits of Martin Luther King. I love how they use both painting and collage, and that they all look a little different. The children worked together to fingerpaint large sheets of paper brown. After it dried, they each cut out an oval for Dr. King's head and a small circle for his nose. They then added hair, eyes and a moustache with black construction paper. Last but not least, a smile with red construction paper. 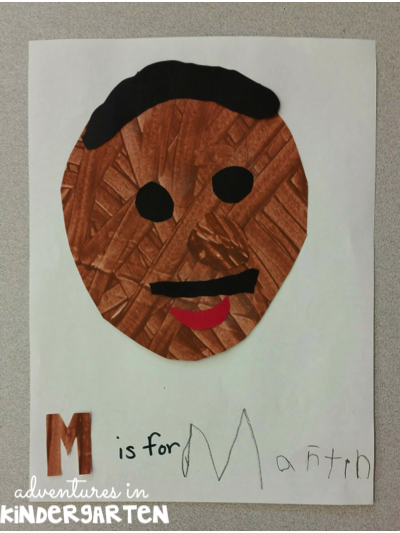 After their masterpieces were completed, each child wrote "M is for Martin" beneath his face. The M is cut from scraps of the brown fingerpainted paper. I love that this not only added a bit of literacy to the art, it helped them to remember his name.